""Braga, rustic houses fully equipped to discover Minho historical region."" Quinta do Rapozinho is a northern Portugal rural complex, situated in a beautiful valley 5 km away from the Cabeceiras de Basto village. There are 6 houses of an old “Minhota” estate that have been restored in their traditional style, surrounded by a large garden, meadows and hills. Each house has a different structure and capacity, being able to host from 2 to 6 people. In all of them a sturdy stone facade, tile roof and rustic decoration, with stone, wood and the use recycled materials and furniture stand out. Good taste without forgetting charm and comfort. Highlights include Casa dos Palheiros attic, Casa do Palheiro Grande ecological construction with bales of straw walls, or the unique beds inside real barrels at Casa dos Toneis. All houses are fully equipped with sleeping area, living room, TV, kitchen, bathroom, heating and outdoor area with barbecue. Guests are provided with a breakfast basket, so that they can prepare it to their liking in the privacy of the house, as well as the possibility of receiving freshly baked bread every morning. In Quinta do Rapozinho one may also order meals, table service, themed dinners or get the products of your choosing at the hotel’s shop. There is a pool area outside with changing rooms and garden furniture, including facilities for outdoor play. Moreover, if you wish to reunite the family, friends or celebrate an event, the old wine cellars are the ideal place to do so. There is plenty to do in Cabeceiras de Basto, from nature and active tourism options, such as hiking, natural parks or river beaches, to cultural visits, such as the villages, historical bridges or monasteries route. Staying at Quinta do Rapozinho also gives you the opportunity to discover interesting cities of the Northern Region, such as Oporto, Guimarães, Braga or Amarante. 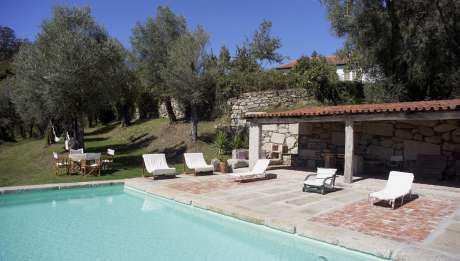 Quinta do Rapozinho is an ideal accommodation to enjoy a few days with the family in the north of Portugal. Being made up of 6 houses of different capacities, you can choose the one that best suits you. They can accommodate from 2 to 6 people, as well as being able to include an extra bed or a cot. The houses are fully equipped and on the outside you can enjoy the pool, the games areas or the meetings in the old cellars. The location of the accommodation also allows to be in permanent contact with nature and make numerous visits and excursions. Admire nature. Enjoy a day with your family in the Peneda-Gerês National Park, the Alto Douro Vinhateiro region, the Alvao Natural Park or the Fisgas do Ermelo Waterfall. Fluvial beaches. You can also choose the fluvial beaches of Cabeceiras de Basto, such as Puente de Ranha, Bucos, Moimenta or San Nicolau. Centers and Theme Parks. Enjoy with your family in the Pena Aventura Park multi-adventure park, with a 1.5 km giant slide. You can also visit the Center for Environmental Education in Vinha de Mouros, the Interpretation Center for Wildlife and the House of Bread in Moinhos de Rei, or the dairy near the rural complex. Route of the Villages. Four alternative circuits have been created: the cultural circuit, the patrimonial circuit, the natural circuit and the religious circuit. Very tempting options to discover the historical region of Minho, so rich in history and tradition. Historic bridges You can visit beautiful bridges such as the Roman bridge of Chaves, the old bridge over the river Moimenta or the bridge of Arco de Baúlhe. Markets. Have a look at the market of the village of Cabeceiras de Basto, which takes place every Monday, and where you will find what is created and cultivated in this land: vegetables, ducks, as well as crockery, wool socks or boots typical of Minho. Hórreo de Carrazedo. Considered the largest in Minho. Churches and convents. Make a cultural visit to discover the heritage of the area, such as the Convent and Benedictine Monastery of San Miguel de Refojos, the Church of San Juan Bautista de Chaves, the church of San Sebastian de Passos or the church of Santa Senhorinha de Basto. North Region. Quinta do Rapozinho is also a good starting point to visit the most interesting cities of the Northern region of Portugal, such as Porto, Guimaraes, Amarante or Braga. If you want to gather your family, friends or your work team, you can do it in the wineries (old wineries). You will have at your disposal equipped kitchen and a table for 8 people. In the large room of the wineries you can hold events for up to 50 people. Start your day with energy. Included in your reservation you will have a breakfast basket to prepare it to your liking and in the privacy of the house, as well as freshly baked bread every morning. Make yourself at home. The houses of Quinta do Rapozinho are warm and cozy, with a very careful rustic taste. They are fully equipped so you do not miss anything. Rest in the lounge by the fireplace, prepare your favorite dishes in the kitchen or prepare a barbecue outside. Casa preciosa en un entorno de naturaleza maravilloso. Recomiendo probar al menos un día la comida de José; todo una experiencia. Gracias Paulo, Teresa y José por vuestras recomendaciones. Lugar espectacular, valle precioso y todo en perfecto estado. Detalles en todos los sentidos por parte de Paulo y Teresa. Recomendable para ir con niños.